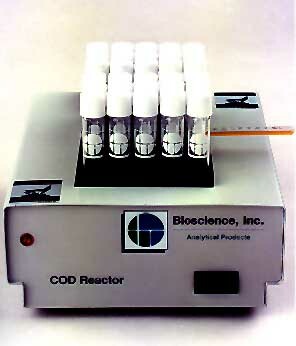 Incorporating a temperature monitor and safety shield, the heater block for micro-COD test vials is designed to require less space than former models. Available in either 15- or 30-tube sizes, these units are used to digest samples to determine chemical oxygen demand (COD) in wastewater. The EPA-approved method uses optical glass containers and pre-mixed reagents, and digests the waste sample at 150°C for two hours. The results are read in a spectrophotometer. Results for non-reporting purposes can be obtained in as few as 15 minutes. Rapid tests can be used in connection with BOD to determine the biodegradability of influents to industrial waste treatment plants. Five reagent types are available for ranges from five to 4500 mg/1 COD, including tests for high, low and standard COD levels, plus mercury-free reagents for low and standard ranges.